The Latest Word: Helix RADE 6.2 PR2: Never on Sunday? In This Edition: Second PR Ships What’s New? What’s Fixed? Why Never on Sunday? 10 July 2011 —Thanks to a strong positive response to our call to arms a month ago, the Preliminary Release Phase for RADE for macOS rolls on. 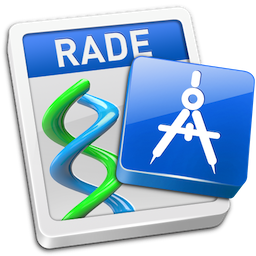 The second Preliminary Release of RADE is available today. For those of you who climbed aboard the Europa Pioneer plan in the opening round, your cards will be charged another $20* today. For those out there among “the rest of you,” remember that if you’re thinking of joining the Pioneer program now, the initial payment is now $40, but all subsequent payments will be $20. Great progress has been made in the month since the first Preliminary Release, with enhancements to both the Graphical User RADE interface and RADE’s AppleScript capabilities, more about which in a moment. We’ve also been working toward making the process of updating easier. 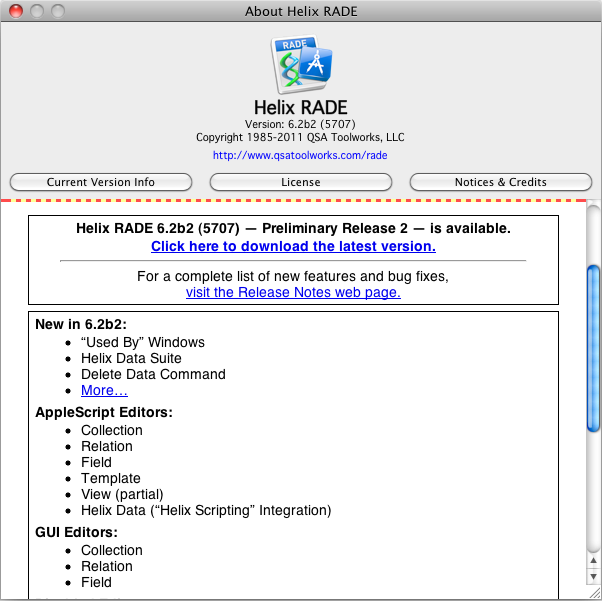 To get the latest version of RADE, open the About Helix RADE window — it’s in the Helix RADE menu in the RADE you already have — and click on the download link. The new version will be downloaded to your computer. Drag the new Helix RADE into your Applications folder. It’s that easy. Also, with this release, we begin to scale back our defenses against “featuritis.” Those of you who have been following this saga since it began are keenly aware of our overriding concern with resisting the temptation to add new functionality to Helix until we were running in macOS. Well that day is now here. We have a family of products that now all run (well, one isn’t exactly “running” yet; more like crawling) in macOS and there’s really no reason at this point to avoid adding anything that will improve the RADE of the future that emerges at the end of this process. That said, in addition to other significant improvements, we have added some new features to Helix RADE for macOS and a number of bugs that have been reported in this first month are now fixed. Read on! A very popular feature of Helix RADE is the “Info” window, which shows you all of the places an icon is being used in your collection. Popular for its utility, but somewhat reviled for its performance, at least the first time you open one in any work session. In RADE for macOS, this Preliminary Release brings you into the next step in the evolution of the Info window. It’s now the Used By window, and it’s completely resizable. The first thing you should notice once you open it is how incredibly fast it is. It’s so fast you might wonder if it even worked. It did. You can see a screen shot of it in the latest Release Notes. The new window, along with the Collection and Relation windows, supports scroll wheels, so if you’ve grown fond of the ability to scroll around in macOS windows, you can now zip around — both vertically and horizontally — in Helix RADE. Another great new Helix feature derived from rethinking the process of changing the datatype of a field. To accomplish this in the past, you had to resort to trickery, such as pretending to throw the field away. Now there’s a new menu command in the icon menu called Delete Data that does the job simply, with no tricks. (It’s also available in AppleScript.) Right now Delete Data only lets you delete the data from a field within a relation. By the time the next release comes out, it will also allow you to delete every record in a relation instantly. The days of building huge “delete all” sequences to wipe data from one or more relations will soon be gone! The Inspector has also been improved and expanded: a number of bugs that were reported have been fixed, and you can now use it to change the name, the custom name and the comments on an icon. And in case you missed it, you can also change the Custom Name of an icon directly in the Collection or Relation window. Another exciting bit of progress is on the “data scripting” front: the Helix Data Suite has at last gone native. Anybody who uses third party applications to access data in a Helix database will appreciate that these Apple events have been rewritten in C++, and are now Intel-native, running 3 to 5 times faster than before. The old “CallHelix” product, created back in the early 90s by Helix developer Fred Stephenson, and updated for PowerPC by Ryan Wilcox, has now been incorporated directly into Helix. For the first time ever, AppleScripts can now communicate directly with Helix to add, retrieve, and delete records. Users of products such as Qilan, Helix Scripting, PHP, HeliPort and HeliMail: rejoice! One of the first problems users noted with the first Preliminary Release was that if you launched it by dragging and dropping a collection, you got a warning dialog about this being a Preliminary Release product, but after you clicked that dialog away, you had to drag and drop your collection on RADE again to get it open. Not any more. We even added a “Don’t show this dialog again” option to it for those who really dislike being reminded over and over that macOS native Helix RADE is not yet complete. Another problem some users reported was that RADE appeared to go out to lunch when it started running a structure check. Actually, a really good thing was happening, but the lack of any visual feedback caused a lot of people to think Helix was hung up and to force quit. This was not really a bug; the problem is that older versions of Update Collection neglected to clean up certain types of old code. For heavily used collections, these could number in the hundreds of thousands, and cleaning them up takes quite a while. RADE was not hanging at all: it was just very busy. So, in order to reassure you that something is going on, there is now an additional progress dialog in the Structure Check code when a large clean up is required. Other changes show that we’re paying attention to the ‘fit and finish’ as well: the Inspector now opens in the upper right corner of your screen, as every self-respecting inspector window we’ve seen in our travels does. AppleScript pioneers will also appreciate a raft of improvements that have been made. You can read about those and other enhancements in the Release Notes. And if you’re still considering jumping on the AppleScript bandwagon, don’t forget our Learning AppleScript with Helix self-paced training course. The first lessons laid the foundation for scripting Helix and, now that Helix RADE is available, there’s no faster way to get up to speed with getting the most out of the RADE in macOS. The people at Late Night Software have even extended the $50 discount off Script Debugger, the AppleScript development environment that makes learning AppleScript even easier. So, why is this edition of The Latest Word titled Never on Sunday? When we realized that the 10th would be a Sunday, it just slipped out and became one of those inside jokes that took on a life of its own. (If the movie reference is lost on you, look it up in IMDb.) When we released the first Helix RADE Preliminary Release last month, we made a commitment to deliver visible progress to you monthly. On the 10th of each month to come, we will unlock another door in Helix RADE for macOS, letting you into another room of the house. That was our commitment to you with the Europa Pioneer program and we’re going to do what it takes to deliver on that promise. Even on Sunday. Sunday may never be the same; well, at least this Sunday won’t. In fairness to those of you who have made the commitment with us, it is important that you know that as positive as the response has been so far, it isn’t going to get us all the way to our destination. Rest assured that we are working on additional sources of funds to get the job done, but ultimately, however, it depends on more Helix users stepping up. The first is simple economics. No one is doing particularly well right now, except perhaps that sliver of the population that always does well. And in spite of four different stewardships since 1983, Helix has been dogged for nearly every day of its 28 year existence by people wondering if Helix will survive. Hard to justify spending money when the future seems in such constant doubt. Yet remember, that’s 28 years and Helix is still here. Seems kind of ironic, doesn’t it? Here’s the problem with waiting. The longer you wait to upgrade, the more you back yourself into a corner. It isn’t just Helix that’s forcing you to consider upgrading your hardware and software. Apple (remember them?) isn’t waiting around for us. This month they will release macOS 10.7, aka: Lion. When that happens, not only will your old Classic applications not run (as they haven’t on new machines for years) but now even your older macOS applications won’t run! With the Rosetta emulator gone, Lion will only support Universal or Intel applications. We get the panicked calls from users who have stayed in Classic, and now their machines are dying. No one wants to spend money needlessly, but it’s easy to get burned if you stay too far behind the curve. We hear all the horror stories about upgrading. People usually do not call when things are going well. That’s why we have to keep reminding you about the positive consequence of upgrading, one that has happened to a lot of Helix users already: you might get an even better product than the one you already love. The third factor holding some people back — and let’s not kid ourselves about this — is AppleScript. We hear people saying that we have lost our way, that we’re abandoning the old way that Helix worked. We have tried and tried to explain what we’re doing and why but we keep running into this wall of noise. It’s almost like the snowdrifts we would encounter when working on Helix code. We never knew how deep they would prove to be or how long it would take to overcome them, but we always made it through. The problem now is that while we’re working to build Helix up, all this noise is tearing it down. In the minds of users still thinking about joining up, the negativity expressed by some in public forums over AppleScript has to be a deterrent. If you’re among the naysayers, let us state it again: AppleScript in Helix is a bridge to the future. Helix RADE will have a graphic editor again. But we need your help getting there; that’s what all these pleas are about. One user asked us to just let him know when there will be a Helix without AppleScript. Here’s the answer we gave him: Never. There will never be a Helix without AppleScript any more than there will ever be a Helix without Document Management, Client/Server, or Posting. One user we know has never used a Sequence in Helix! He’s probably not alone. But he’s supporting the work we’re doing, rather than waiting for us to produce a Helix ‘without sequences.’ If your position is that you hate AppleScript so much that you are willing to throw away 28 years of progress simply because that progress is now extending into an area you don’t have any use for, then there’s probably nothing we can do to bring you back. Helix is a rich development toolkit. Very few of the thousands of users of Helix use all of it. If you’re using some other application to do something Helix could do for you, then perhaps you are missing out on something. If not, Helix has you covered. Adding AppleScript capabilities to Helix gives us two things we need: the ability to escape Classic sooner, and a new capability to do things with Helix that could never have been done before. Even if you have no intention of ever using AppleScript with Helix, don’t let this keep you from climbing aboard. When we’re done, you will be able to completely ignore AppleScript once again. We promise. And everyone wants you to come along.